A state bordered by Lake Superior and Lake Michigan along with the upper Mississippi River. The Native Indians of the region have included the Ioway, Ho-Chunk and Menominee tribes. By the time Europeans arrived they found the Kickapoo, Fox, Ojibwa, Pottawatoemie and Sauk tribes. French explorers arrived in the Wisconsin region by traveling the Great Lakes in 1634. Additional Frenchmen came as traders in the 1650s and 1660s. No permanent French settlements were made over the years. The British gained control of the region after France lost the French and Indian War in 1763. Not until 1783 when the United States gained the Wisconsin property after the American Revolutionary War. The Americans developed the territory into mining for lead rather than fur trade. It was then that many new immigrates went to Wisconsin for the mineral wealth. From many eastern states and several European counties, new immigrates arrived headed for Wisconsin. Many of the miners who had arrived were Cornish and settled in the southwestern part of the state. This sudden influx of white miners prompted tension with the local Native Indian people. Following two Indians wars, one in 1827 and another in 1832, the Indians were forcible removed from the region. 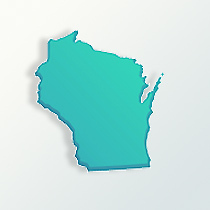 Wisconsin then becomes a territory in 1836 and achieves statehood in 1848. It had become also the center for northern abolitionism. An interesting note for Wisconsin genealogy is that many migrants from New York and the New England states came to run the new state’s finance, business and educational systems. When the mining areas declined, agriculture became a principal occupation in the southern half of the state. Railroads were built across the state to help transport grains to market and the building of farm equipment became big industry for Wisconsin. Wheat production by the 1890s was not doing well in the 1890s due to overuse of the soil. Dairy production rapidly grew as a major business. With that came the cheese making industry for Wisconsin. The European immigrants arriving to work the dairy industry were Germans, Norwegians, Belgians, Dutch, Swiss, Irish, Portuguese and Poles. By the early 20th century and the massive immigration in all of the United States, many came to Wisconsin to work manufacturing jobs. Industries in cities like Milwaukee ranged from brewing beer and food processing to heavy machine production and tool making. By the end of the 20th century Wisconsin also provided service industries for medicine, education, agribusiness, and tourism. To work as general laborers many people from Mexico have come to Wisconsin during the late 20th century as well as people from Vietnam. Looking at Wisconsin genealogy, the waves of immigrates to Wisconsin are reflected in its population over the years. In 1850 Wisconsin had 305,300 people. In 1860 it jumped to 775,800 as its population. By 1890 the state had 1.7 million people. The largest ancestry group in Wisconsin are the Germans at 42.6 percent, then the Irish at 11 percent and Polish citizen at 9 percent. The Norwegians settled in lumbering and farming areas in the northern and western part of the state. The African-Americans in Wisconsin represent 6.5 percent of the overall population and mostly live in the Milwaukee area. The Protestant religions dominant due to the strong German and Norwegian heritage.